While the European-style spa experience is wildly popular, Asheville’s Japan-inspired Shoji Spa & Lodge is distinctively different. 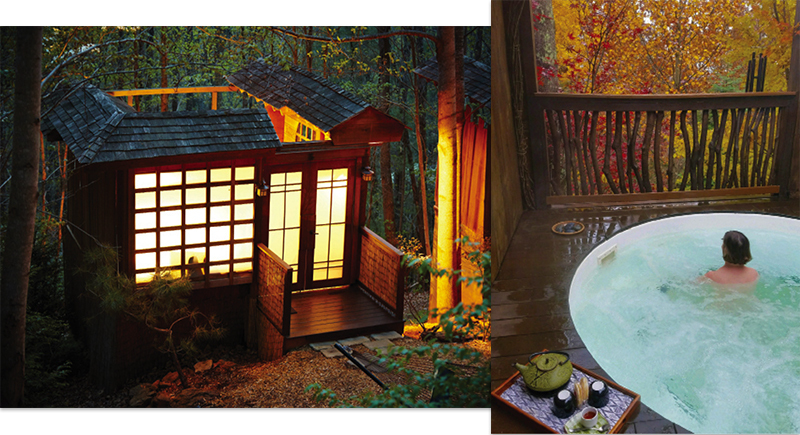 From its mountain perch, Shoji offers the centuries-old experience of the Japanese onsen spa. On their native soil, onsens owe their existence to hot springs, the result of volcanic activity on the island. A culture of bathing developed around these springs that has become an important tradition, one which Shoji’s founders have successfully transported here despite the lack of natural volcanic-heated springs. Nestled above the Blue Ridge Parkway, Shoji’s spa facilities, four private hot tubs, and three spa lodging options scatter across a scenic slope accentuated by walls of bamboo. Walkways and trails meander through the woods to the enclosed tubs, and Japanese design elements envelop visitors, who can intersperse their soaks with a dry cedar sauna, seasonal cold plunge, or arctic shower. After a massage, guests can tuck into one of Shoji’s private lodging options. During an early winter visit with my wife, I settled into the 104-degree water, sipping tea from a Japanese kettle, eating rice cakes, and looking out at the mountain forest. Japan is even invoked in the landscape, where Western North Carolina’s oaks and pines keep company with brilliant Japanese maples, cedars, and myriad other plants that decorate Japanese spa country. Shoji offers numerous packages: A Hike and Soak pass, for example, features a guided walk on the Mountains-to-Sea Trail and a two-hour hot tub, with a percentage of the fee going to the Southern Appalachian Highlands Conservancy. And local residents can purchase two hours of spa time for the price of one. In addition to Japanese-inspired body treatments, massage therapies offered include deep tissue, hot stone, shiatsu, Swedish, and Thai. Guests who are suitably noodled out by contrast therapies and a massage can wander back to one of the three on-site accommodations, which sleep two, four, or six guests. From the art to the bedding, each features elegant Japanese touches. Two of the accommodations include full kitchens, but Shoji is so close to Asheville (about a 10-minute drive) that it’s a snap to dine out or order in; conveniently, a half-dozen local sushi restaurants deliver. North Carolina might not have the thousands of mineral-rich hot springs that bubble up into Japan’s outdoor onsen pools, but Shoji has created the perfect environment utilizing local resources. And while guests won’t see the famous frosty snow monkeys of northern Japan soaking at Shoji, bear sightings are not unheard of. As we drove down the winding, woodsy road after checking out, we reflected that this place is a retreat indeed, one offering a palpable sense of escape that feels a world away, but is right next door.